Almost half way between Namibia's capital, Windhoek and Keetmanshoop in the South you will find the town of Mariental. Mariental is the administrative and commercial capital of the Hardap Region in southern Namibia, and supports several economic industries, including ranching, an ostrich abattoir and large scale irrigated farming. The irrigated farming is made possible by the regions 2 main water supplies, the Fish River and Hardap Dam. The town stands on the edge of the Kalahari Desert, but because of the irrigation systems in place it is able to support crops of cotton, wheat, lucerne, maize, grapes, tomatoes and a variety of garden vegetables. Mariental is home to a large population of Nama-speaking people, descendants of the early Khoi inhabitants of Namibia. The people of Mariental are known for their big smiles and hospitality. Originally known as Zara-gaebia (dusty), Mariental was named after the area's first colonial settler, Herman Brandt, who named it Marie's Valley, after his wife, Anna Maria Mahler. He'd purchased the land from Nama chief Hendrik Witbooi in 1890. Over the years that followed up until 1907 the area was became a battleground between colonial and Nama forces, and quite a few German civilians died in guerrilla raids. 1912 saw the introduction of a railway through the town and Mariental's resident's petitioned for village status, but the German surrender to the South African Defence Force in 1915 put an end to this petition. Their wish was however granted in 1920, when with the construction of Namibia's first Dutch Reformed Church Mariental was awarded village status. It was later proclaimed a municipality in 1946. Although mainly a place to refuel or an overnight stopover, Mariental is still home to the Hardap Dam which does attract its fair share of bird lovers and small boats enthusiasts. The dam is also the largest reservoir in Namibia, with a water surface of about 25 square kilometres, a capacity of 320 million cubic metres and an 86.2 metre long dam wall. There are also a few private game reserves in the area including, the Intu Afrika Kalahari Private Game Reserve, the Hardap Game Reserve and the Bagatelle Kalahari Game Ranch. 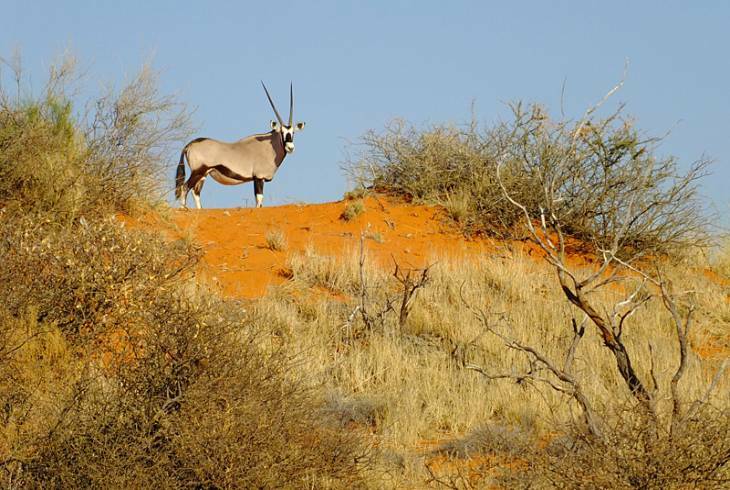 For those interested in safaris or hunting, Mariental boasts some of the best experiences in Namibia with available game including springbuck, blesbuck, giraffe, ostrich, leopard, zebra, kudu, gemsbuck, hartebeest, eland, blue and black wildebeest. Mariental overview. Mariental Accommodation and Information.